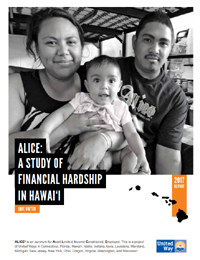 Aloha United Way recently released the ALICE Report for Hawai‘i to raise awareness about the economic challenges faced by hardworking Hawai‘i families and individuals. ALICE households – an acronym for Asset Limited, Income Constrained, Employed – are employed, but can’t afford the cost of living in Hawaii, and lack a safety net for emergencies. Their income may be higher than the Federal Poverty Level (FPL), but their income falls short of basic necessities. In Hawai‘i, 49% of households are ALICE or live below the poverty level. They are in every community, women and men, young and old, all races and ethnicities. They could be our neighbors. They could be us. I grew up ALICE, but I didn’t know it. We were three generations living in a house in Hawai’i, with three-and-a-half incomes contributing to the household – and me. And a scrappy dog. We had four adults contributing to the household, and one child who didn’t know that there was anything unusual about it. For financial reasons, for childcare, for convenience, it made sense to live together, ALICE. We were lucky that we inherited a home from my great-grandmother, so we just had to worry about property taxes and maintenance. We added security bars after our house was burglarized, and one year we all got together to paint the outside of the house, but we couldn’t afford major upgrades. We didn’t go to farmer’s markets, but we had fruit trees in the yard. We didn’t buy organic food, but we stocked up on canned goods (and toilet paper). We didn’t go to a lot of restaurants, concerts, or plays, but we saved money to splurge on vacations a few times when I got older. ALICE households are not new in Hawai‘i. What’s new is the spotlight we are shining on them. We’re acknowledging that we sometimes can’t live comfortably on a single or even dual income. We’re acknowledging that as childhood extends into the late teens (or early twenties), and people live longer, multi-generational families are a better solution than living and struggling alone. In 2016, 8% of all family households in Hawaii were multi-generational (three or more generations), according to the US Census Bureau 2016 American Community Survey 1-Year Estimates. The ALICE Report reminds us that it’s hard to thrive on our own. Growing up, did you live in an ALICE household? Do you live in an ALICE household today, or do you have friends and family who live ALICE? Minimum wage, the lowest wage that hourly employees earn, is a controversial issue. Supporters of minimum wage laws believe that it helps lift people out of poverty and reduce income inequality (the gap between higher-income and lower-income people). Opponents of minimum wage laws believe that it reduces the number of new jobs and raises prices, as businesses adjust for higher labor and payroll costs. Rather than debating the value of the minimum wage, I would like to propose that we create two categories of wages: minimum wages and minimum living wages. The minimum wage would be the lowest wage that entry-level, unskilled employees earn. It means that businesses could limit their up-front investment in an employee who will only be temporary. The minimum living wage would be the lowest wage for more experienced, skilled employees who have worked part-time or full-time for an business for over one year. It would put into law the current practice of offering employees raises during annual performance reviews. Businesses take most of the risks when hiring entry-level employees, so it makes sense to offer a lower minimum wage. Businesses must conduct interviews, offer job training, fill out employment paperwork, trust employees to show up on time and do the job. Of course, new employees take risks as well – that the paperwork will be correct and that they will get paid – but there is less uncertainty in accepting the job, especially if a business has been around for a few years. Employees have the reassurance of visiting the business and seeing how it works before accepting the job. After one year on the job, wages could be increased to the minimum living wage, a higher wage that is closer to what employees need to live and work in the area. The minimum living wage could also be tied to increased benefits, such as additional vacation time, family leave, retirement plans, or continuing education subsidies. This one-year minimum living wage probation allows businesses to evaluate the employee’s skills and fit with the company. It also allows employees to decide whether they want to keep working for the company and gives them job experience if they decide to look for a new job. 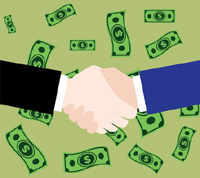 A good business with sound finances will voluntarily offer raises the employees who show up and work hard, even if they can’t offer raises every year. While there is always the risk that an unscrupulous or poorly-managed business will fire employees before the one-year mark to avoid paying a higher wage, those businesses would suffer from higher job turnover, constant training, and poor reputation. Do you think that two minimum wages would be an effective compromise between employees and businesses? What do you think of minimum wage laws? When I was growing up, we didn’t drive very far. Most of our driving to work, school, and shopping malls was done within 5 miles of our home. To my parents, a long road trip was about 20 miles from Honolulu to “the country” (Kaneohe and Kailua) to visit relatives. Sometimes I would take the bus to Waikiki or Windward Mall. I don’t know whether my parents didn’t like to drive, gas was too expensive, or they just didn’t need to go anywhere else. When I got my first job, gas prices were reasonable and I was willing to drive farther, more often. I ended up commuting 25 miles one way from home to work. I made unnecessary trips, sometimes to run a single errand. Road trips got longer, too (it was cheaper than going to the movies or an amusement park). Traffic got worse, and I started leaving earlier for work and staying a little later at work to avoid it. I learned that there’s a high cost to low gas prices. Then gas prices started going up, and I changed my lifestyle – for the better. I found a job closer to home. I ran multiple errands in one trip. I tried to find the shortest route to my destination. I drove less and spent more time in nearby areas. I started paying more attention to pollution and the quality of our air. Now gas prices are down again. This month, gas was $2.319 at Costco in Honolulu – the lowest I’ve seen in years. 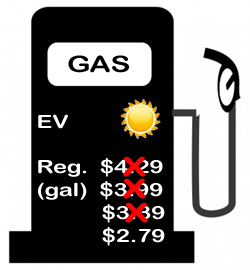 I know that I should be happy about low gas prices – who likes paying more for anything? – but the truth is that I’m a little dismayed about low gas prices. I never thought I’d say this, but I think Hawaii should pay more for gasoline. This doesn’t mean that we need higher gas taxes. This means that Hawaii’s economy and Hawaii’s environment may not be able to afford low gas prices. We need to think harder about how far and how often we drive. We usually don’t have a lot of choices about where we live and work – that depends on what we can afford and what jobs we are offered – but we can choose our leisure time. With high gas prices, we would be forced to reevaluate our driving habits. Or we can choose, right now, to change our driving habits. We can choose to spend more time at neighborhood beaches, parks, and libraries instead of driving around the island. We can choose to get out of our cars and spend less time at the drive-through. 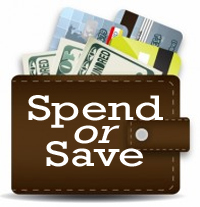 We can choose to shop less and take our time with purchases, instead of rushing to buy. We can choose to reduce carbon exhaust, cut down on traffic, and enjoy cleaner air. How have lower gas prices affected your driving habits? Do you think low gas prices help or hurt Hawaii? Last week, the Federal Reserve announced that it would maintain the current 0% federal funds rate. Some people cheered, because it meant that interest rates would be low and the stock market wouldn’t crash. Though I understand some of the reasons behind the decision, I was disappointed. I believe that low interest rates do help our economy. Low interest rates make life more affordable, make higher education more attainable, make home ownership more achievable, and make it easier for businesses to expand and hire more employees. But I wouldn’t be the person I am today without high interest rates. I think that I would be less responsible, more in debt, and have more “stuff” if I had grown up in an age of low interest rates. Those high interest rates helped me build character, reinforced by the “pay in cash” philosophy that my parents and grandparents used. * High student loan rates encouraged me to pay down my student debt. My college loan rates were a formidable 6% to 10%. My grandfather paid off a big chunk of my student debt direct to the bank after I graduated, from money he had set aside as I was growing up. I paid off my second, smaller student loan as soon as I could, because I hated paying the high interest on the loan. * High savings rates encouraged me to save. Today, savings accounts pay less than 1% interest, making it more tempting to spend money instead of save it. That’s nothing like the 4% to 6% savings rates I enjoyed as a young adult. High interest rates persuaded me to save money instead of spend it, and spurred me to put away money in an IRA when I was just starting my first job. Those savings made me feel more secure in an uncertain job market and when faced with inflation. * High mortgage rates encouraged me to pay off my mortgage as soon as possible. My first home mortgage was around 8% or 9%, while today’s mortgage rates are probably half of that. My husband and I chose a home we could afford and decided to pay off our mortgage as soon as possible. By paying a little more each month, especially if we received a bonus or tax refund, we shaved off months from our repayment schedule. * High credit card rates continue to encourage me to control my spending. With credit card rates between 15% and 20% on purchases, it means we should do our best to pay credit card balance in full every month – or to use credit cards for emergencies only. Over the years, high credit card rates have helped me control impulsive shopping and made me question whether something is really worth it. I hope that interest rates will start to rise soon, so that our savings accounts can grow and my son can build consumer discipline and character. But it may be a long time before we earn more than a few cents every month in our savings account. How have interest rates affected your life? Have you had good and bad experiences with low interest rates? Can you condense two years of study into 101 lessons? Michael W. Preis did just that in his book, “101 Things I Learned in Business School” (2010), with illustrations by Matthew Frederick. It’s a small book with one-page facts, explanations, and advice, about basic business principles. It’s loosely organized and punctuated by black-and-white graphics. 1. Start-ups: Business is not a single field of endeavor. (#2) Successful small business owners have to master accounting, finance, marketing, production and operations, organizational behavior (management and hiring), and economics. 2. Pricing: Set prices according to what the customer will pay, not necessarily according to costs. (#92) It’s vital to know the costs of bringing a product or service to the customer and also the competition’s pricing, but best to set a price based on the customers’ perception of value. 3. Sales: A business buys a copy machine because it needs copies, not because it wants to buy a copy machine. (#52) A good salesperson first seeks to understand the true nature and extent of a customer’s problem, and only then offers a solution. 4. Marketing: A feature is a fact. A benefit is how it helps the customer. (#54) Benefits, not features, ultimately sell products. 5. Customer Service: Complaints can be good things. (#55) When a customer tells a business where it failed, he or she is doing the business a favor. A complaining customer usually wants to continue doing business with the company, and when their complaints are resolved quickly and satisfactorily, often become very loyal. 6. Purchasing: Good, fast, or cheap: pick two. (#72) You can’t have it all. If you want high quality work performed quickly, you’ll have to pay a higher price. If you want work done quickly at a low price, you’ll sacrifice some quality. If you want high quality work for a low price, it will take more time. 7. Management: Tell others the result you need, not how to get it. (#79) A good manager acts at two extremes of scale: they ask for general values (make it functional and fun) or they ask for specific details (make it weigh less than 13 ounces and finish it within three months), leaving it to employees to come up with a solution. 8. Time Management: When overwhelmed, try doing fewer things, but doing them better. (#80) There are important tasks that must be done promptly, unimportant tasks that must be done promptly, important tasks with no particular rush, and unimportant tasks with no particular rush; and sometimes there are things that seem crucial but may not need doing at all. 9. Business Growth: There are three ways to grow a business. (#11) You can increase market share, grow with the market, or expand into a new market. 10. Business Valuation: Not all capital is economic. (#5) A business’ value is more than just the money in the bank. It has intellectual capital (proprietary information and in-house knowledge), human capital (employees’ talents, skills, and knowledge), social capital (human relationships), and brand equity (reputation). What are the important lessons that you’ve learned in business and management? What do you wish someone had told you when you first got started? Accidents happen. Sometimes accidents are weird or embarrassing or hurtful. And sometimes accidents can lead to great inventions. Birgit Krols’ “Accidental Inventions: The Chance Discoveries That Changed Our Lives” (2012) gives us an entertaining, easy-to-read glimpse at some of the useful inventions resulting from “mere fluke, through laziness, absent-mindedness, or carelessness” (page 6). The book emphasizes that invention is part discovery (hard work), part creativity (figuring out how to use it) and part salesmanship (convincing others that they need it). And it inadvertently shows us how we can encourage inventiveness when we are trying to invent a product or even solve a problem. * Discover a new use for an old product. You don’t have to invent something new, just a new way to use it. Kleenex tissues, invented in 1924 as a replacement for cotton in gas masks, were re-introduced as disposable tissues in 1930. Crafters do this all the time, turning old building materials into new furniture and artwork. * Find a creative use for a failed invention. So it’s not exactly what you were looking for. Can it be used in another way? Superglue was invented by chemist Harry Coover in 1942 during his search for a ultratransparent plastic, and was ignored for over 10 years before being marketed. Post-its were invented by 3M scientist Spencer Silver in 1980 during his search for a strong adhesive, but it took his colleague, Arthur Fry, to see the practical uses for the weak glue. * Get inspired by boredom. Frisbees were originally pie tins made by Frisbie Baking Co. in 1871, until bored students realized that they could be thrown in the air. * Turn a nuisance into a solution. Piggy banks were invented around 1900 by an English potter asked to make “pygg” (clay) banks, and crafted “pig” banks instead. Velcro was invented by electrical engineer Georges de Mestral in 1941 after noticing burrs of burdock caught in his socks and his dog’s fur. * Be cautiously careless; or, Don’t be discouraged by carelessness. Scotchgard was invented by 3M scientist Patsy Sherman in 1952 when she accidentally dropped a bottle of synthetic latex on her assistant’s white fabric tennis shoes. “Disappointingly crass is the media obsession with money. Whenever a large group of visitors arrives in the islands, the news stories are not about their hopes and dreams or what they came to see or do, but about how much money each group brings in,” wrote college teacher, administrator, and founder of Kalamaku Press Dennis Kawaharada in his book, “Local Geography: Essays on Multicultural Hawaii” (2004). Eight years later, not much has changed. Every month, the Hawaii Tourism Authority reports visitor statistics, focusing on arrivals (number of visitors, length of stay, air seats) and expenditures (total spending, daily spending, trip spending). This research is important for hotels, airlines, and businesses. It helps companies forecast business, inventory, and employees. And it feels great when we hear that our local economy is doing well. But the focus on visitor spending and “economic benefit” has overtaken the local news reports too. Recent headlines in the Honolulu Star-Advertiser read: “Hawaii hotels hit midyear with record revenue: the lodging industry brings in $1.6 billion with Oahu and Maui leading the way” (8/1/12). “Hawaii tourists spend record $1.2 billion in June” (7/26/12), “Isle visitors lift sales figures” (7/8/12), “Vegas visitors expected to be up slightly for 4th” (7/4/12). We should remember that visitors hear and read these same news reports. From these headlines, they might conclude that no one cares about their Hawaii experience or why they came here, as long as they spend money before they leave. We should also remember that our children notice the emphasis on tourism and money. These news stores can influence their opinions about Hawaii and our visitors, and it could change the way they interact with visitors if they get jobs in the visitor industry. * What made them choose Hawaii over any other place in the world? * What did they expect to find when they got here – and how did we meet their expectations? * What did they do here? What would they like to do again? Could their experiences have been better? * What did they enjoy about Hawaii’s natural beauty and unique cultural? * What surprised them about Hawaii? If we know about the people behind the numbers, residents could relate better to them and feel more connected to them. Businesses could decide how to improve their experience of Hawaii. Lawmakers could see them as “seasonal residents” instead of “transients” who pay their taxes (without representation in Hawaii) and then leave. Let’s ask the media to report more about our visitors as people. And let’s treat our visitors more like future neighbors.